An empty boat, Kaz II, was found drifting off the coast of Australia. The table was set for dinner, the radio on and no distress calls had been sent. The mainsail had been ripped. No adverse weather conditions were reported and the lifejackets, dinghy and emergency beacon were all still on board. There was no trace of the crew who had recently purchased the vessel and were sailing back to Western Australia. 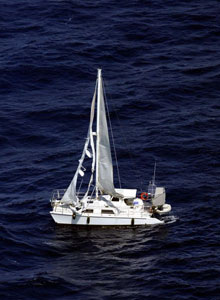 All three crew members were experienced sailors. Rumours of a staged disappearance began to circulate but the coroner explained their disappearance as follows: a fishing line got caught in the propeller and one man fell in while trying to free it. A second man fell in while assisting the first man back in the boat. The third man tried to turn the boat around to pick up the other two men but was knocked out of the boat by a swinging boom. It would have been extremely difficult to reboard the boat once in the water and all three men are presumed lost at sea.